1) What sparked your interest in aviation? When did your interest in STEM begin? I was surrounded by incredible teachers from the very start of my life. I was raised by my mother, aunt, and grandmother who all happened to be STEM teachers. With so many teachers by my side, I had unique access to math and science early on, which sparked my interest in STEM, especially weather. From age six, I was fascinated by the weather books my mother would give me and I would tell people that I was going to be a meteorologist when I grew up. Now, I have the opportunity to be on the other side – getting to see my own daughters show an interest in STEM, competing in science fairs and learning to apply the scientific method to everyday life the same way I did. 2) What kind of obstacles have you faced getting to where you are now? When I graduated from high school, I wanted to go straight into pursuing higher education. However, due to economic factors, getting to a university on the mainland U.S. did not seem like a possibility. Unfortunately, obtaining a bachelor’s degree in meteorology was not an option in Puerto Rico at the time either. Therefore, I majored in mathematics with a concentration in physics. My senior year, I was rewarded a fellowship from NASA to study meteorology at Florida State University where I was the only civilian student and one of two women studying meteorology. I felt like I was only seen as “the Puerto Rican girl” until I started to prove myself in class and people started to notice my grades. In the process of obtaining my PhD, I got an opportunity to work for the National Weather Service in Puerto Rico, in the aviation division. From there, I got certified in aviation-specific meteorology, worked with the Federal Aviation Administration (FAA) and even did weather forecasts for Kennedy Space Center. Even though I faced adversity along the way, I thoroughly enjoyed the steps it took to get me to where I am today. I truly believe that if you work hard, have a good heart, and are passionate about what you are doing people will take you seriously and offer you resources and guidance. 3) What responsibilities does job entail? What does an average day look like? No day is truly the same in this career. I split my time between giving weather reports on television and radio, and raising awareness through education and speaking opportunities. Take today, for example - I am speaking to students at a local school about earthquakes because of a recent seismic event in the area. Since Hurricane Maria, I have given about 193 talks at conferences, schools, and events. I have been lucky enough to be able to speak to so many communities’ including schoolchildren, hospital workers, insurance companies, emergency management groups, and weather professionals. I want people to know how Hurricane Maria truly affected Puerto Rico and its people, and help educate communities on how to better deal with the forces of nature impacting their community. The most important part of my job is being there to listen to and communicate people’s stories. I am not the story – they are. If I am able to educate and give people the knowledge and resources they need to stay resilient and tackle natural disaster and climate change – then the work put in is worth it. 4) Do you have a female role model who inspires you? Of course, my three mothers – my mom, aunt and grandmother inspire me every day. They raised me and gave me all the resources and independence to truly follow my dreams. In addition, my professional role model is Dr. Joanne Smith – the first woman meteorologist in the United States. She was an incredible teacher, researcher, and a true force in the weather community. I had the blessing of meeting her at the AMS convention. One of the highest honors of my life was being awarded with the Joanne Smith Award for meteorology. All I can hope to do is pay forward all of the guidance and help I’ve received from the wonderful women in my life. I want to be a mentor for not only young women but all students looking to get into STEM careers. 5) If you could go back and tell your younger version of yourself one thing, what would it be? I would tell myself to always stay focused and that putting in the work to achieve your dreams really is worth it. Also to make sure you always pay it forward and help to serve others. 6) How has JetBlue affected you / the work that you do? 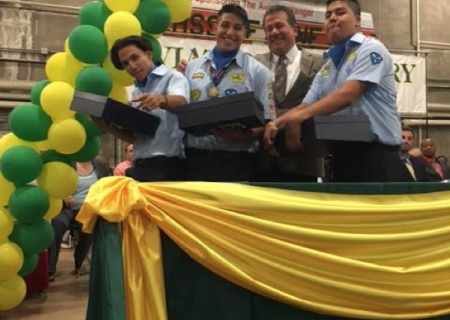 The JetBlue Foundation was instrumental in making the In the Clouds program possible. Through the program, we have been able to help educate and mentor 25 girls between the ages of 10 and 14 from underserved communities across Puerto Rico. For many of the girls, In the Clouds was their first time in an airport. 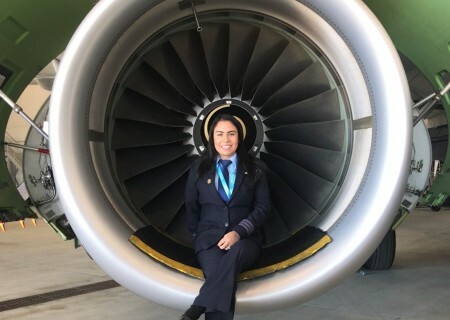 For seven weeks, the girls engaged in different aviation-related experiences such as going to the Isla Grande Airport where they learned about the technical, businesses, and safety procedures behind the scenes. They also experienced a flight simulator at Politechnica University, which they loved. Experiences like these are so important to these girls because it shows them that they can reach for careers in aeronautics, engineering, and of course meteorology. They see firsthand that these fields exist and people just like them grew up to pursue them. 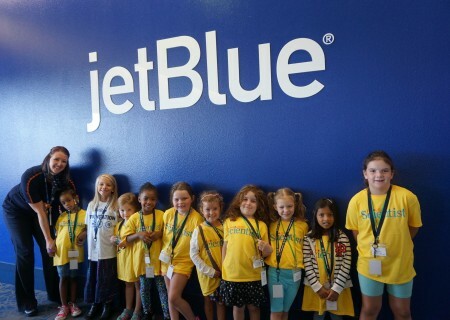 We are so thankful for JetBlue’s support and dedication to encouraging young girls to pursue STEM, and for supporting initiatives like mine in Puerto Rico. By expanding programs like ours, we can truly open doors for these girls and show them the big, beautiful world out there. 7) What milestones have you already reached or are you currently moving towards? I am always trying to move forward and push myself. I am always looking for opportunities to continue communicating with and educating communities in the event of another natural disaster like Hurricane Maria. People were scared of how vulnerable we were after the hurricane, but we all have to work together for a better Puerto Rico. I hope that the families and children who see us every day on TV and radio feel comforted when they see that we are also taking time putting on education programming at their schools or talking in their communities. I am very proud to work with a great group who are building a science museum in Puerto Rico and to leave that kind of legacy behind. I want people to know that science is a social innovation that impacts communities, and we serve our community by teaching them. I just want to keep working to help build a better and safer Puerto Rico. 8) What advice you do have for someone who wants to be in your role or a STEM career field? Pursue passion. It sounds like a cliché, but I found mine at a very young age, and I enjoy every single moment of it to this day. From there, find ideas and projects that make you a happy person. You have to find a source of people. Once you understand what you like to do and what makes you happy. Find ideas and to get projects going. How to better serve others – it makes you a very happy person. Life is so short, you really have to make sure you do what you love. To her, she found that at a very young age. Just finding that thing that makes you enjoy every single moment of your day. That is what you have to pursue. It does not matter what. 9) How can we get more girls interested in STEM? Accessibility and visibility. Through the In the Clouds program, I have learned that it is not about teaching them about flight. Instead, you give students the opportunity to experience it themselves, put it in their mind that studying STEM can be a force of good. Being able provide models to show how all of these people with similar backgrounds have done it is crucial. I also think that mentorship is incredibly important. Mentorship is the way to share your story and learn about others, which is the best counseling you can give. Then they can pay it forward as well.